Critical definitions at your fingertips! 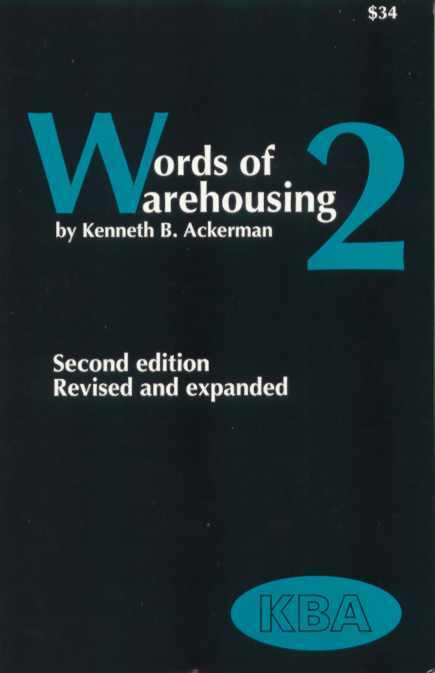 This popular book of warehousing terms and definitions has been completely revised and updated to include even more of the words you need to know. The book translates between warehousing's sometimes convoluted terminology and plain English. Readers benefit from Ken Ackerman's decades of Experience in the field. ABC management Application of Pareto's Law, or the 80/20 rule The ABC classifications are determined by descending rank order of all products according to each as a percentage of the total. A products are the highest in volume, C products are the lowest. Ranking can be performed in terms of volume, dollars, or product weight. Management of inventory is then guided by the segmentation of the products into the ABC categories. Abnormal demand Orders that come from unanticipated sources or at an unexpected time of the year. Absolute liability Common carrier accepts liability and is not protected by normal exemptions found in bill of lading or common law liability. Absorption costing An inventory evaluation in which variable costs and a portion of the fixed costs are assigned to each unit of production. The fixed costs are usually allocated to units of output on the basis of direct labor hours, machine hours, or material costs. Also Allocation costing. Acceptance The termination of a common-carrier contract when a consignee acknowledges receipt of a shipment. Acceptance can also signify a promise to pay if specified in the contract. Acceptance number The cutoff number used in acceptance sampling when deciding whether the lot is accepted or rejected. Acceptable quality level (AQL) The level or limit of line item characteristics that are used in quality control. Accept/reject advice A standardized notice sent to vendors advising that a shipment has been accepted or rejected and will be kept, rejected, or otherwise disposed. It contains pertinent information about the shipment and, if rejected, the nature of the rejection. Acceptance sampling The process of inspecting a portion of goods rather than examining the entire lot. The lot is accepted or rejected based on the quality of the sample. Access aisle Passageway that allows access to a storage area. Access time In data processing, it is the time required in milliseconds to position read-write heads on a cylinder position of a computer disk.